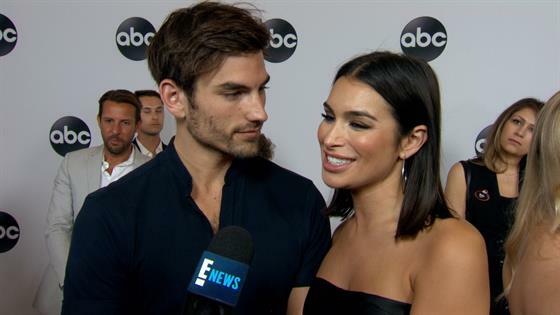 Ashley Iaconetti and Jared Haibon are preparing to reach a new milestone in their relationship. As the Bachelor in Paradise stars continue celebrating their engagement, the happy couple is ready to witness a very special family reunion. "Our families are meeting on a Royal Caribbean cruise. That's what we're looking forward to," Ashley shared with E! News exclusively. "It's just going to go very well." Jared added, "We've always felt that our parents would get along very well and both of them are super excited to meet each other. This will be the first family outing where everybody's there and what better way to do it than on a cruise?" While cameras won't be present for this vacation on the seas, fans will soon be able to witness the couple's romantic engagement this season on Bachelor in Paradise. And since that fairytale day, both Jared and Ashley have started planning their dream wedding. "We just got our wedding planner Troy Williams and we're narrowing down a date next summer so we're thinking July," Jared explained to us. "We're just pinpointing the days we want." Until then, the happy couple is loving every moment of the new season of Bachelor in Paradise. Whether it's the love story between Tia Booth and Colton Underwood or the crazy antics of Jordan Kimball, the iHeartRadio podcast hosts couldn't get enough of Tuesday's season premiere. "We were both really taken back. We think it's the best Bachelor TV we've seen in years," Ashley shared. "We didn't even look at our phones. You know a show is good for two hours when you don't touch your phone." As for the newly engaged Becca Kufrin and Garrett Yrigoyen, Ashley and Jared both have some advice for the couple. Watch the video above for their relatable tips. Bachelor in Paradise airs Monday and Tuesday nights at 8 p.m. only on ABC.